Nominations were announced yesterday, with a small increase in lower house candidates but a substantial shrinking of the size of Senate ballot papers. 1056 candidates have nominated for the House of Representatives, a slight increase from the 994 who nominated in 2016, but still less than the 1188 who ran in 2013. There has definitely been a decline in the size of the Senate ballot papers in each state. We are seeing the effects of the first half-Senate election under the current voting system, with all state ballots substantially smaller than they have been at the last two elections. Clive Palmer, newly returning to federal politics at the head of his United Australia Party, has been pursuing a case in the High Court which could change the way election nights take place in this country. I thought I’d run through the main points of the case and the impact if he was successful. Clive Palmer’s case is a challenge to the AEC’s practice of designating two candidates in each seat that they expect to make the final preference count, in order to expedite the counting of preferences on election night. Nominations for the federal election will close tomorrow, with those nominations being announced on Wednesday, when the ballot draws will be conducted. We should have the final list of candidates in ballot order by the end of Wednesday. I’ll do a blog post on Thursday morning with the final nominations information. I have been regularly updating a list of federal candidates with the help of Nick Casmirri and a bunch of commenters (thanks to you all). I thought I’d drop back onto the blog and give you an update on where we are up to in terms of candidate numbers. As a comparison, check out this post I wrote at a similar point in last cycle. If you’d like to examine the data yourself, it’s all here. At the moment I have identified 783 candidates for the House of Representatives. This compares to 772 candidates I had identified in 2016 as of the morning of nominations closing. In 2016 we ended up with 996 candidates, so it looks likely we will end up somewhere similar this year. It appears that there are substantially less groups running for the Senate this time around than in 2016, although there’s sure to be some last-minute announcements. Ben is joined by Shaun Ratcliff and Paddy Manning to discuss the latest federal polls, seats where independents are challenging the Coalition, and the conclusion of the NSW upper house count. Thanks to 2SER radio in Sydney for the use of their studio. We knew all along that 17 seats would be decided on a quota, and the eighteenth seat has been clear for a while. The Coalition won eight seats, Labor six, Greens two, and one each for One Nation and the Shooters. This left three seats in play. The primary vote counts had One Nation, Labor and the Christian Democratic Party leading in the race for these three seats (in that order), followed by the Liberal Democrats, Animal Justice and Keep Sydney Open. 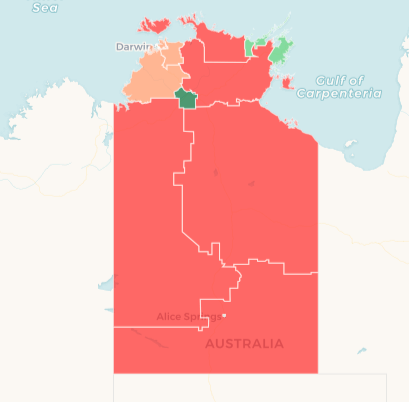 The actual result saw Labor win the nineteenth seat, followed by Animal Justice and One Nation, with the Christian Democratic Party missing out. This leaves us with an upper house with 17 members of the Coalition and 14 members of Labor. There is a block of five right-wing crossbenchers: two Shooters, two One Nation and one Christian Democrat (Fred Nile). There is also a bloc of six centre-left crossbenchers: three Greens, two Animal Justice and ex-Green independent Justin Field. If the Coalition wins the support of all five right-wing members it has a majority, but it can’t afford to lose any of them. They could alternatively swap in the entire left bloc on more progressive legislation, or try to win over the AJP, Field or less likely the remaining Greens to substitute for one of the right-wing parties. It’s worth noting that, while the Coalition has a history of working with the Shooters in the upper house, for the last four years they have mostly worked just with Nile and his departed colleague Paul Green, while the relationship with the Shooters has deteriorated. I won’t try to predict how the Coalition will work with Mark Latham and his One Nation colleague Rod Roberts. The most interesting story out of today’s preference distribution was how preferences played a bigger role than in past upper house elections, and how this helped boost the left to win an extra seat over the right. Nominations for the federal election will close next Tuesday, April 23. This is the first full federal election since a massive number of federal MPs lost their seats in 2017 and 2018 due to ineligibility, mostly due to citizenship. We’d expect about 1000 people to run for the House of Representatives (my list already has over 700), and approximately 500-600 candidates will run for the Senate. All of these people will need to jump through these hoops to prove they are eligible, and may well end up not really knowing if they are. Last Friday the Liberal Party announced that three of their Victorian candidates will be replaced because of potential incompatibility with section 44 of the constitution, making them potentially ineligible. All three were contesting unwinnable seats in Melbourne, and thus had no chance of actually getting elected, but in the current political environment it seems like the party judged they couldn’t risk the possibility that these candidates’ potential ineligibility would become a media story. This latest chapter in the section 44 saga clearly demonstrates that this clause will continue to be a problem, it can’t be resolved simply by ‘doing the paperwork’, and that the only solution is to amend the constitution. 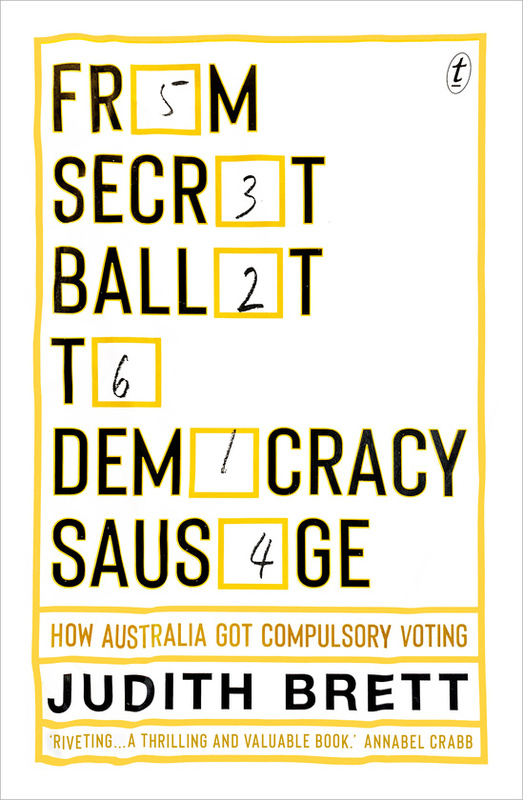 I just recently finished From Secret Ballot to Democracy Sausage by Judith Brett, and I thought it was an excellent read and would be of interest to the readers of this blog. I put together a book review for the website Dictionary of Sydney, which has now been published, if you’d like to have a read. Scott Morrison visited the Governor-General early this morning, calling the federal election for May 18. It’s unusual to call a federal election on a Thursday. It’s more typical for it to be called on a Sunday. There’s some good reasons why he’s going today, and they mostly revolve around a number of public holidays coming up in the next few weeks. Rolls will close at 8pm one week after the writs are issued. If they followed standard practice and issued the writs on the Monday 33 days out from the election, this would have resulted in the rolls closing at 8pm on Easter Monday, at the end of a four-day long weekend. Instead I expect the rolls to close at 8pm next Thursday, just before the long weekend. Nominations typically close on the Thursday of the second week of a five-week campaign. Those nominations are then declared, along with the ballot draws, on Friday, with voting to commence the following Monday. If this timing was used, it would result in nominations closing on Anzac Day. Issuing the writs four days early allows this nominations process to take place over Tuesday and Wednesday – in between Easter and Anzac Day. It’s still possible they could stick to Thursday and Friday, but I’d expect them to bring it forward. If you want to read more about the election, please check out my federal election guide. It includes guides to all 151 House races and all 8 Senate races, each with their own comment section. You can use the following map to click through to a seat guide, or alternatively use the alphabetical list, the list by state or the pendulum. And if you find all this useful, please consider signing up as a donor via Patreon. I can only put together the detailed election guide that can be so useful thanks to the support of donors. That’s it for today. Please feel free to use this as an open thread to discuss the election announcement. We are now very close to the end of counting for the NSW Legislative Council. The original plan was to finish data entry on Wednesday, with the button to be pushed on Friday morning. This has now been pushed back to Monday morning. In this post I will run through the votes counted so far (which is most of them) and the possible role of preferences in deciding the final three seats. This post was originally going to start with an analysis of the votes counted so far and what is left to count. 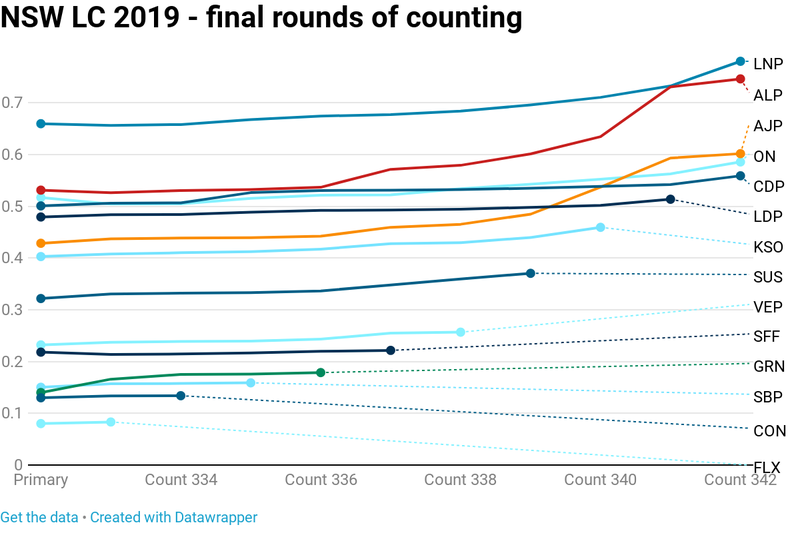 In this regard I built a small model which factored in how many of the votes in the ‘others’ pile had been counted and what was left in that pile, effectively allowing you to match up the two counts and simulate a much higher proportion of the vote counted. That model was in part inspired by the good work being done by Ross Leedham on Twitter. He has been diligently updating his model more regularly to give us a sense of the votes reporting each day. But so much vote-counting took place across Wednesday that we are now pretty close to the end. Over 90% of the counting has finished in 81 out of 93 seats, with the lowest vote-count being 79% in Newcastle. So at this point I think we might as well just look at the real figures for the check count. These are as of 10pm on Wednesday night. So it’s pretty clear the first eighteen seats have been decided, largely as we expected the day after the election. None of the parties who were lumped in the ‘others’ pile polled well enough to be assured of a seat before the distribution of preferences. 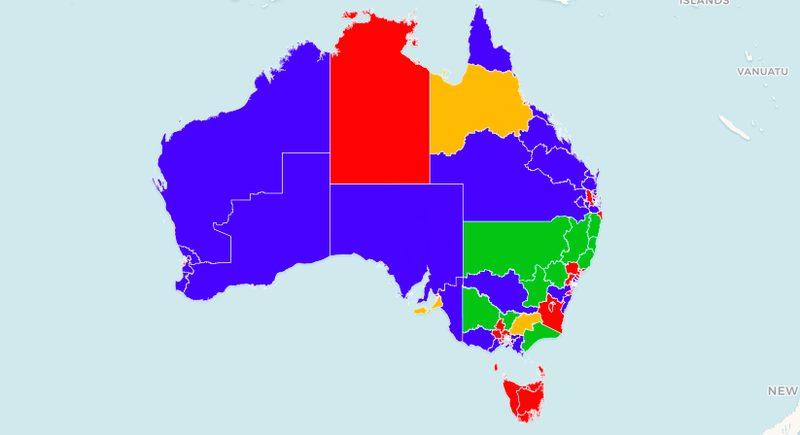 The Coalition has held eight seats, down from eleven, despite not quite making eight quotas on primary votes. Labor has won six seats, up from their existing five. The Greens have retained two, while One Nation and the Shooters, Fishers and Farmers have each won one. This is where preferences come into play, and things become much more difficult to predict. The NSWEC divides votes into three categories: Single Above the Line (SATL) votes which just give a ‘1’ above the line, Random Above the Line (RATL) votes which have multiple preferences above the line, plus Below the Line (BTL) votes. The number of RATL votes has doubled from 15% to 28%, while there has been a 50% increase in BTL votes from 1.8% to 2.7%. This means that over 30% of voters have marked preferences, up from less than 20% in 2015. This means that candidates will need a vote closer to a quota to win a seat, and gives a better chance for trailing candidates to catch up. One Nation, Labor and the Christian Democratic Party are clearly the frontrunners for these last three seats. The Liberal Democrats are not far behind, so if they do well on preferences they could catch one of the others (likely the CDP). I don’t have a great deal of information on whether the LDP or CDP is in a stronger position to win. It seems likely that preferences will flow more strongly amongst progressive voters, whose parties largely cooperated on preferences. This suggests Labor should be in a good position to win. Animal Justice and Keep Sydney Open are outside chances, but I wouldn’t rule out one of them winning. They both swapped preferences with each other, and received preferences from the Greens and Sustainable Australia. These four parties have about 1.2 quotas left over. Yet many voters for these parties would have cast a vote without the aid of a how-to-vote, and it wouldn’t be surprising if a lot of these preferences instead flow to Labor. We will find out the results on Monday morning, and I’ll be sure to be back with more analysis after that result. Counting has now concluded for the Legislative Assembly as part of the New South Wales state election – the Legislative Council will be concluded on Friday Monday. 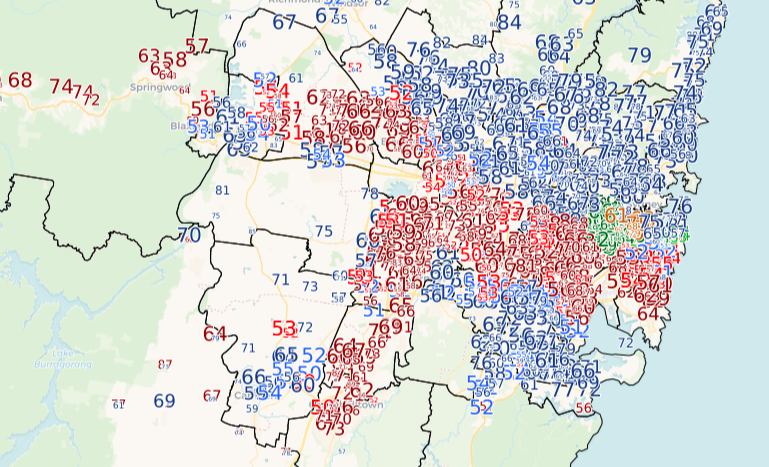 In this post I am featuring a map of the two-candidate-preferred (2CP) vote across New South Wales at the booth level, as well as the 2CP swing where appropriate. I have also assembled the new NSW post-election pendulum, which tells us something about the challenge in front of Labor in 2023.